This year I’m excited to start a new travel series called ‘USA Exploring’ to showcase some of the incredible places I’m experiencing for the first time in America. For me, an incredible travel experience is often remembered by the delicious and unusual food I ate, the beautiful and amazing things I saw and the fun and educational things I did, so I’ll be sharing the best things to ‘eat, see and do’ in each city or state. I hope this series is helpful for you if you’re visiting any of these cities, or maybe inspires you to start planning your next trip! First stop: New Orleans. Upon moving to the United States we had a big ambition to tick off as many states as possible during our time here and asked every person we met about their favourite city to visit. 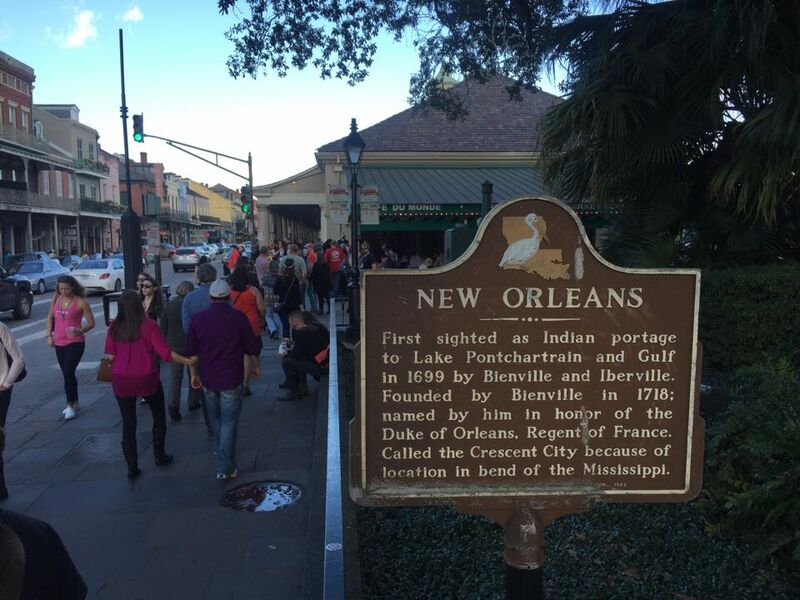 Amidst many remarks for the commonly touted and tourist swamped cities of New York, Chicago and San Francisco there was always one little city that ended at the top of everyone’s list: New Orleans, Louisiana. Described as a place that’s “like no other city in America”, “all about food, food and more food”, and “home to the best jazz you’ll ever hear”, it quickly went to the top of our travel hit list and we sat patiently waiting for the right opportunity (and survivable climate) to visit. So when one of our Australian visitors planned a trip over a weekend in early January, we knew we couldn’t pass up the chance to go and began planning a jam-packed 48 hours, ready to experience all the quintessential things that truly make NOLA a city like no other. New Orleans is famous around the world for it’s food – from a homecooked gumbo to jambalaya, and pralines to beignets – there’s just about something to suit everyone’s appetite. Seafood is definitely well loved fixture on every menu, though unfortunately, as a non seafood eater, couldn’t quite bring myself to eat catfish or flounder but I was game for a bite of alligator. The places we ate at introduced us to a mix of beautiful creole and cajun flavours and showcased the vibrant colour and tastes NOLA is known for. 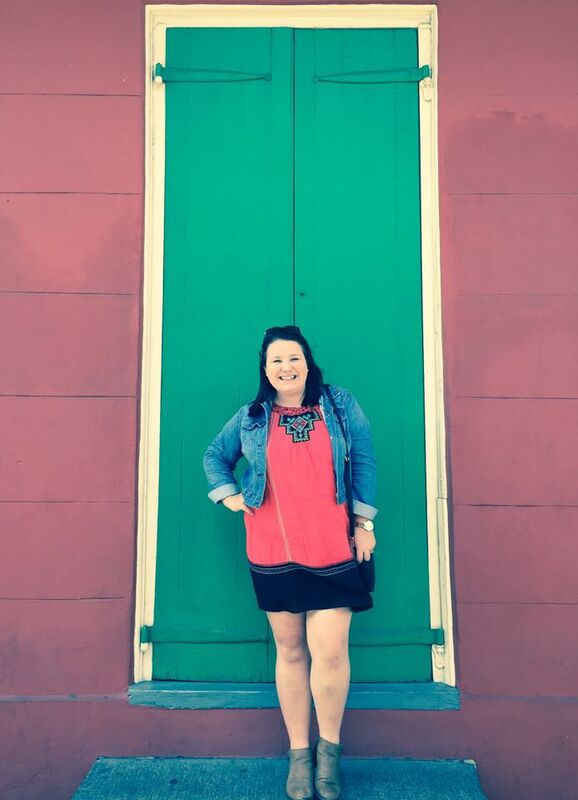 Cafe du Monde – an absolute MUST for a true New Orleans experience. 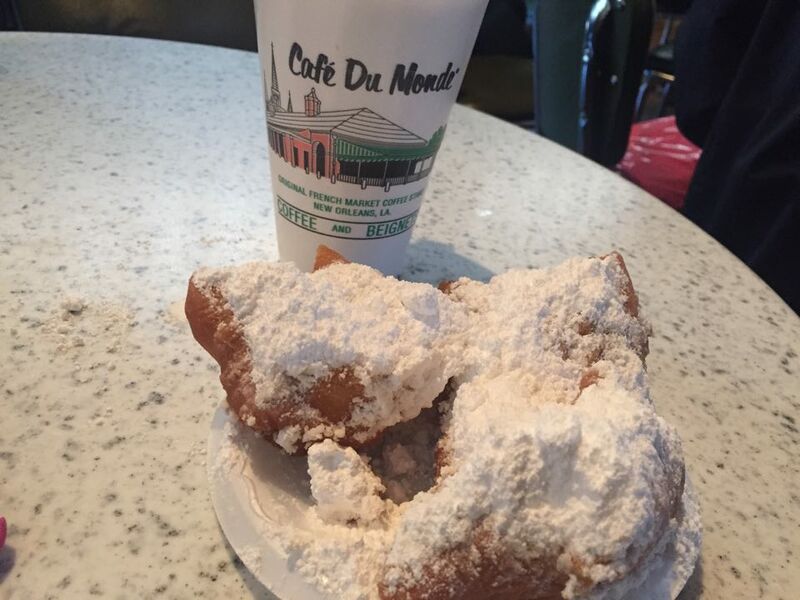 Cafe du Monde has been serving one thing since 1862 and boy do they do them well! Beignets (pronounced Ben-YAYs!) are a famous French-style donut COVERED in icing sugar. Expect an experience that’s a little more like “would you like some beignet with your icing sugar” and not the other way around! Though there was always a long line out the door, the turn-around is quick, made simple by an small menu, easy cash-only ordering process and very prompt service. You can enjoy your beignet with a cafe au lait, tea or hot chocolate and of course lots and lots of icing sugar. Come prepared to get icing sugar all of your face, clothes and fingers! The best part is, Cafe du Monde is open 24 hours, 7 days a week so you can come for your sugar fix whenever you need a hit! I’m definitely not ashamed to say I went back for round two after the first experience! Jax – a fun restaurant bar between Jackson Square and the Mississippi on Decatur Street, Jax serves a mix of local fare and pub favourites for those craving something a little more familiar than catfish or alligator! Having arrived off a draining red-eye overnight, I opted for the familiar and ordered a burger but was impressed with the delicious cajun spices mixed into the chicken. Navin was much more adventurous and ordered jambalaya with alligator and frog legs and we definitely made sure we all got a taste! While alligator isn’t something I’d eat every day, it was definitely an experience trying it as the sun shone over our table overlooking the Mississippi River. Stanley – on my last day in town I was in the mood for a good milkshake and found myself at Stanley, conveniently located at Jackson Square too. Despite ordering one of their famous thick and creamy milkshakes, their chicken caesar salad caught my eye because for once it didn’t include egg! Woohoo! The pesto-infused caesar dressing and perfectly cooked chicken made this one of the best salads I’ve ever eaten, and paired with their deliciously seasoned shoestring fries, made a perfect brunch on my final morning in NOLA. 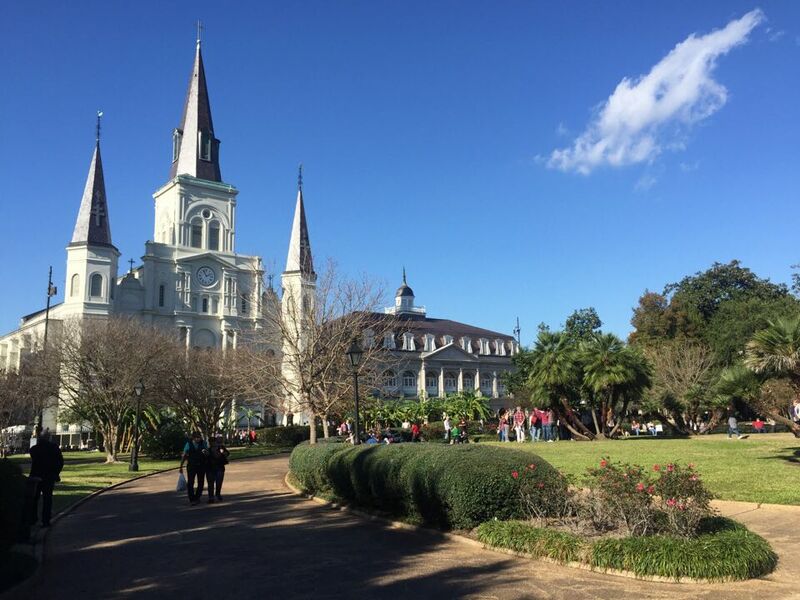 The staff here are very attentive and friendly, and the cafe overlooks the park and St. Louis Cathedral – definitely allowing for some great people watching! 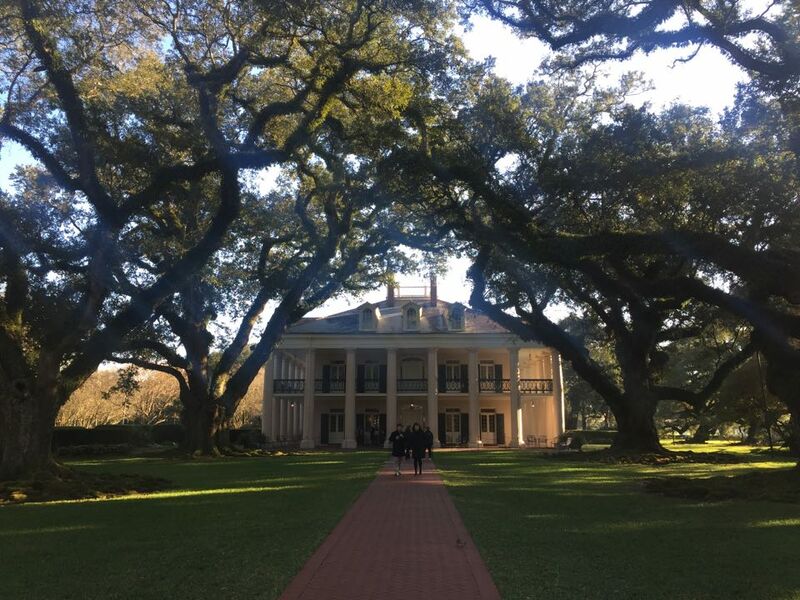 Oak Alley Plantation – if you can’t get enough of gorgeous Southern architecture and decor like wrap around porches, swinging seats and hanging ferns you need to get yourself to one of the many plantations, about a 45 minute drive from New Orleans. Oak Alley Plantation is the second most photographed home in the United States (behind the White House!) and there’s a good reason why – the entrance to this beautiful home is paved behind a mile of hundred year old oaktrees, providing a canopy that feels similar to a guard of honour. 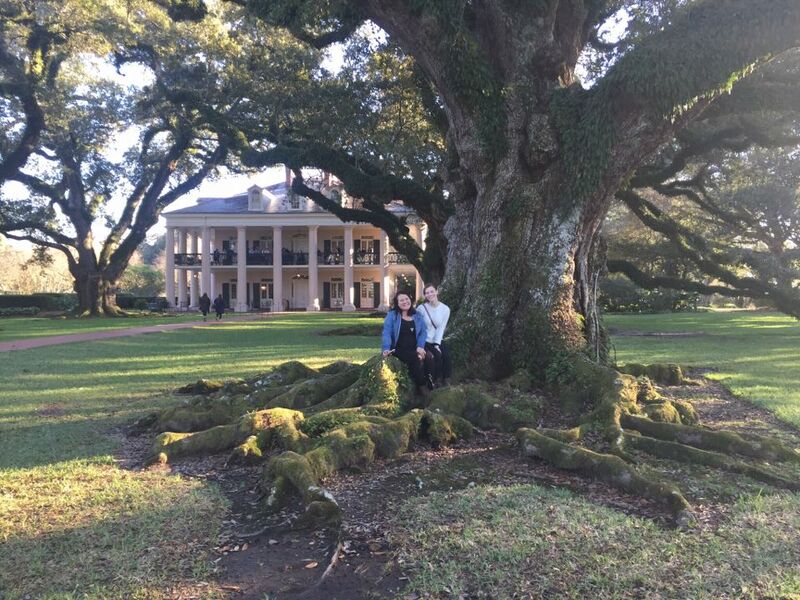 Whilst the Oak Alley tour sticks to the history of the white owners of the home, visitors can take a self-guided tour through the slave quarters on the property. Though simple and certainly not the focus of the tourism that Oak Alley drives, I found the slave quarters incredibly moving and humbling as I learnt the history of the many slaves that had passed through these grounds before me. 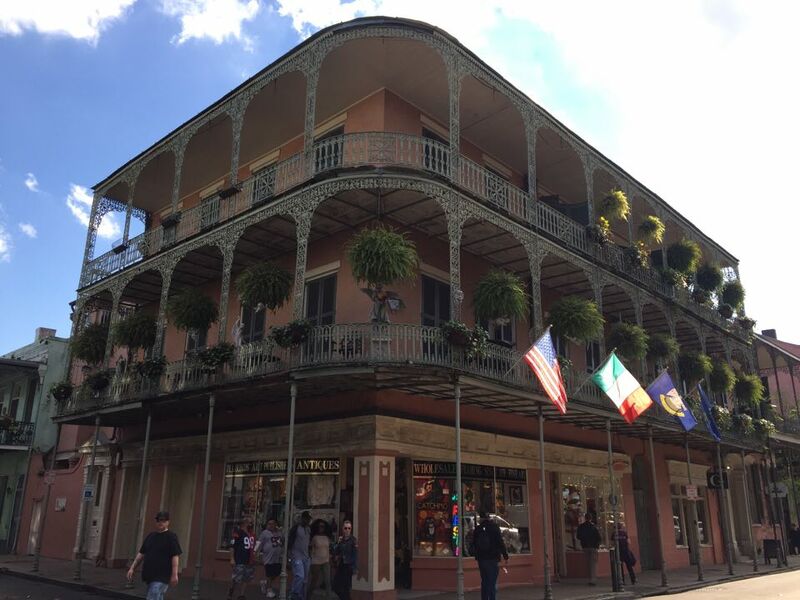 French Quarter – the infamous district of New Orleans, home to Bourbon Street, Jackson Square and those delicious beignets, the French Quarter is a must see on your visit to NOLA. From the colourfully painted buildings, southern architecture, French street names at every corner and the eclectic mix of street performers who’ve come across the country to delight visitors with their magic and music, the French Quarter is home to all things weird and wacky that makes New Orleans such a unique place to experience. 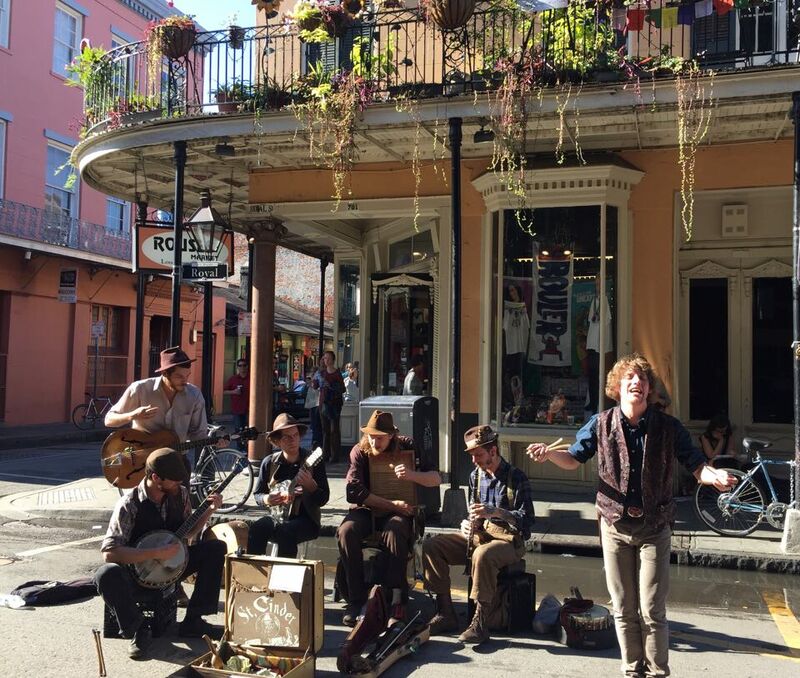 Though we didn’t get time, there are plenty of cooking classes, walking tours and voodoo houses to check-out in the Quarter, and definitely don’t miss a ride on the street car! 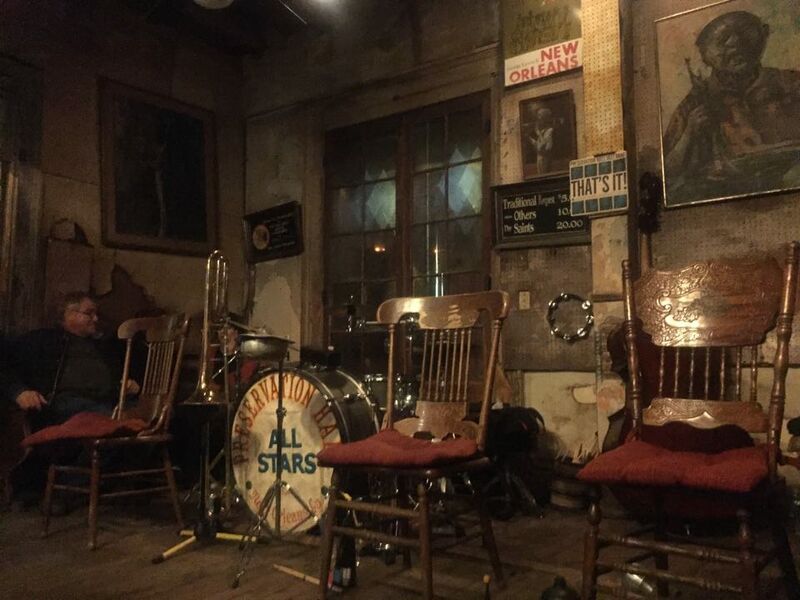 Preservation Hall Show – undoubtedly our trip highlight – the Preservation Hall puts on 45 minute jazz shows every night at 8, 9 and 10pm. Featuring a band of 8 musicians who live and breathe traditional New Orleans jazz, we had a fun evening of clapping, singing, whistling and bopping along to some familiar favourites and some impressive trumpet and saxophone solos. Tickets can be pre-booked online for $35-50 for reserved seating, or bought at the door for $15-20. About 100 people can fit into the room, but as we opted for door tickets we sat on the carpet in front of the band – so come ready to sit cross-legged for an hour! The band’s rendition of Louis Armstrong’s What a Wonderful World will forever be etched in my memory as one of my favourite moments in America! 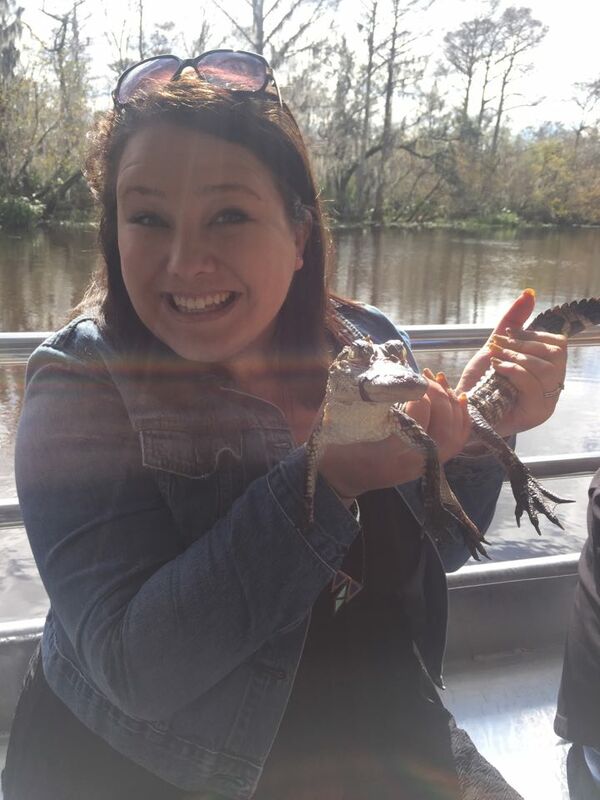 Swamp Tour – the inner crocodile hunters in us prompted us to book a boat tour to ride amongst alligators in a New Orleans swamp. Though we enjoyed our boat ride among the eerily quiet waters and willows of this swamp, sadly it was far too cold for any amphibians to surface so the closest we got was holding a baby alligator! I’d love to come back and experience the swamp during the warmer months, as I’m sure there’d be a lot more alligator action! Despite our alligator disappointment, we enjoyed seeing raccoons, too many bird varieties to count and even seeing a fisherman’s old swamp shack where Ella Henderson’s Ghost video clip was filmed. 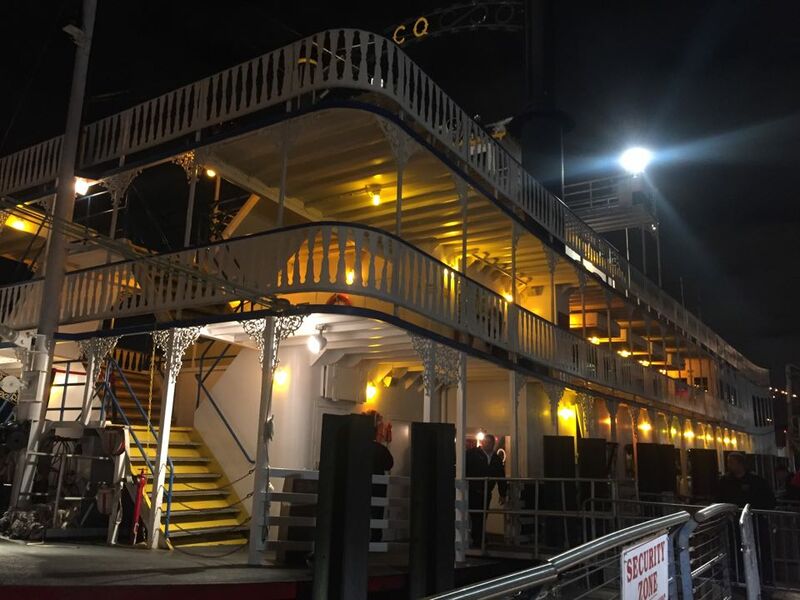 Mississippi Jazz Cruise – another unique experience for the NOLA visitor – jumping on board the Creole Queen for a cruise down the Mississippi River. This is just one of those super touristy experiences we felt we had to do – mainly to test we still knew how to spell Mississippi (Mrs M, Mrs I anyone?!) and secondly because it ticked off the chance to eat local food, listen to some great jazz and breathe in the fresh air of the River. We recommend getting there well before boarding because food starts coming out before the ship departs and you definitely don’t want to miss the gumbo, jambalaya, corn bread or bourbon bread pudding (um, wow.) Drinks aren’t included but a well-stocked bar with NOLA themed cocktails can be purchased as you start meandering down the river to the sounds of the trumpet and saxophone. Again, something I’d love to do over summer because it was dark and chilly by the time we stepped foot on the deck to take photos – but then again, not sure my body could take the southern humidity that summer blows in. Well worth the experience if you’re in NOLA for a couple of days and want to experience the food, music and Mississippi all in one go! After our quick weekend in NOLA, I’m also proud to say that New Orleans is one of my favourite American cities too. It’s eclectic mix of food, music, people, culture and history make it a must-experience destination for anyone visiting the States. 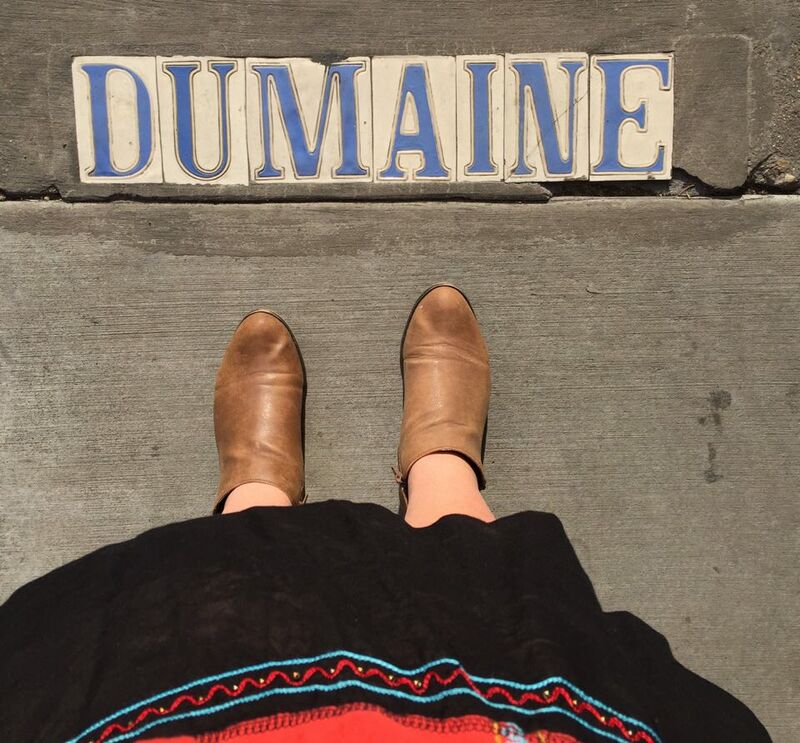 Is NOLA on your bucket list or have you been before? Let me know what you loved last time you visited in the comments below! The only alligator we came close to! Coming up next on USA Exploring: Washington, D.C.